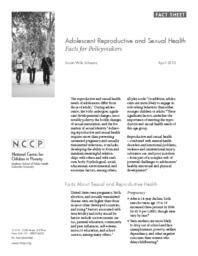 The reproductive and sexual health needs of adolescents differ from those of adults. During adolescence, the body undergoes significant developmental changes, most notably puberty, the bodily changes of sexual maturation, and the formation of sexual identity. Achieving reproductive and sexual health requires more than preventing unwanted pregnancy and sexually transmitted infections, it includes developing the ability to form and maintain meaningful relationships with others and with one's own body. Psychological, social, educational, environmental, and economic factors, among others, all play a role. In addition, adolescents are more likely to engage in risk-taking behaviors than either younger children or adults. These significant factors underline the importance of meeting the reproductive and sexual health needs of this age group. Reproductive and sexual health — combined with mental health disorders and emotional problems, violence and unintentional injury, substance use, and poor nutrition — form part of a complex web of potential challenges to adolescents' healthy emotional and physical development.